Emilia Phillips is a poet. She is the author of Signaletics (University of Akron Press, 2013) and two chapbooks including Bestiary of Gall (Sundress Publications, 2013). Her poetry appears in AGNI, Beloit Poetry Journal, Green Mountains Review, Gulf Coast, Hayden’s Ferry Review, Indiana Review, The Journal, The Kenyon Review, Narrative, The Paris-American, Poetry Magazine, Third Coast, and elsewhere. She’s the recipient of the 2012 Poetry Prize from The Journal, selected by G.C. 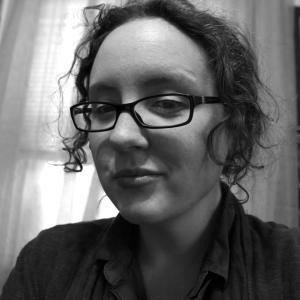 Waldrep; 2nd Place in Narrative’s 2012 30 Below Contest; and fellowships from Bread Loaf Writers’ Conference, U.S. Poets in Mexico, Vermont Studio Center, and Virginia Commonwealth University where she received her MFA in poetry in 2012. She serves as the prose editor for 32 Poems and has been appointed as the 2013–2014 Emerging Writer Lecturer at Gettysburg College. I never knew that archeologists throw in contemporary objects after they finish a dig! That’s intriguing to think about. I didn’t know that either. Plenty of room for irony there, as Emilia hints at too.